Yesterday I began writing about what Joseph Campbell called the monomyth (see Writing And The Monomyth), although I drew more from Christopher Vogler's version of the myth than Campbell's. The hero has just crossed the threshold from the ordinary world and has landed, probably with a few bumps and bruises, in the special world. In a screenplay this plot point would also mark the beginning of the second act. Blake Snyder in Save The Cat! make the point that the Special World should be as different as possible from the Ordinary World (for instance, The Wizard of Oz, Star Wars, Miss Congeniality). If the Ordinary World is the thesis then the Special World is the Antithesis. Something BIG needs to happen to propel the hero (because I'm talking about the monomyth it feels natural to talk about heroes and villains rather than protagonists and antagonists) from the Ordinary World into the Special World. The hero must enter the Special World of the adventure willingly, he can't be tricked or abducted, it must be an intentional act. Blake Snyder makes the point that this is also the place where we start the "B Story", a subplot that, in some way, is the antithesis, the opposite, of the "A Story", the main plot. In Legally Blond this is where Elle Woods (played by Reese Witherspoon) meets Paulette (played by Jennifer Coolidge) in the beauty shop. Paulette--big and showy--stands in stark contrast to Elle's other, more reserved, friends. The B Story is often a love story, one that echos the theme. If there is a 'feel good' part of the story, it comes out here. We have almost reached the middle of the story. The hero must now become serious and prepare for the ordeal ahead of him. If your hero has a love interest there's time for one last love scene before facing the ordeal awaiting him. This is a good way, too, of making the stakes clear. In preparation for the ordeal, the hero might try to 'think like the antagonist', to get inside his mind. However your hero does it, he's going to have to prepare for the ordeal. Even if he is blindsided by the danger he needs to make a conscious decision that he will confront the antagonistic force, whatever it is. At this point perhaps the hero reorganizes his party, perhaps he makes alliances with his enemies. As he gets closer to the ordeal the pressure builds and the mettle of his traveling companions--as well as his own--will be tested. As the hero approaches the inmost cave he is beset with obstacles. Common obstacles are illusions--perhaps illusions created by threshold guardians--ominous warnings, impossible tests (I always think of the Kobayashi Maru in this context! ), and so forth. We have reached the middle of the story and are in the midst of Act Two. The hero will confront the antagonistic force working against him and either appear to win big or lose big. Neither of these, though, will be a complete victory/defeat. Michael Hauge calls this "the point of no return". The hero is now completely committed, there is no going back to the Ordinary World except by finishing the journey. For instance, in The Firm at the midpoint Mitch McDeere is given a choice: go into witness protection and live in fear of being killed by the mob or spend the rest of his life in prison. Whatever happens his life has been irrevocably changed. - A false peek (it all seems to go right for the hero) or a false collapse (everything seems to go wrong). - The stakes are raised. 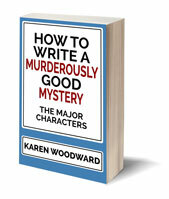 The midpoint needs to change the whole dynamic of the story. Fun and games are over, now things become much more serious, much more intense. The midpoint is a place of transformation, of death and resurrection. Either here at The Midpoint or, later, on The Road Back, there is often a death, either a literal one--for instance, the hero's mentor dies--or a symbolic one. Someone could tell a story about death or, this is Blake Snyder's suggestion, show a dead flower. But there should be a hint of death, a reminder of the price the hero has had to pay for his victory. Well! It seems, once again, I've underestimated how many words this would take to explain. I'm going to leave off at the midpoint--it seemed appropriate--and I'll pick up this discussion again tomorrow. Can you think of a movie, a movie you liked, that does not follow the structure of the monomyth? 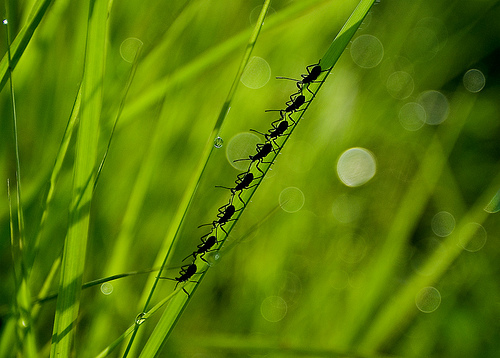 Photo link: "the army" by linh.ngan under Creative Commons Attribution 2.0. Thanks for such a thought-provoking post (and series). I've been trying to absorb as much as I can about story structure over the last few months, and Snyder's "Save The Cat!" has been one of the books I've enjoyed. I hadn't quite figured out how to relate it to Joseph Campbell, though, in terms of the novel I am working on. This analysis is HUGELY helpful. Thanks David! "Save The Cat!" 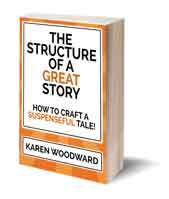 is a great book, I love having a slightly different perspective on what is essentially the same thing: the structure of story. Yes, the two systems are quite different. Although Blake Snyder's framework is much the same as Chris Vogler's up to the midpoint, they diverge sharply afterward. Enjoying your comparing the two systems. I have looked at both of them, as well as others. I have not compared these two the way you have. I am learning from you. Thank you. There is one thing I want to quibble with. Blake Snyder had a point that the B story should start NO LATER THAN. Many people miss this. One reason it sticks in my head is that I usually start my B story in Act I, or in Answering the Call. Looking forward to the rest of your comparison. Hi Loyd, thanks for your kind words. "There is one thing I want to quibble with. Blake Snyder had a point that the B story should start NO LATER THAN." Just clarifying, you're saying that the B Story should begin _no later than_ (but possibly earlier than) the start of Act 2? You know what, that seems right to me. In many of the movies I've seen the romantic interest is introduced in Act 1. "The B story begins on page 30. And the B story of most screenplays is the love story. It is also the story that carries the theme of the movie." Blake seems adamant that the B Story begins in Act 2 (Act 2 begins on page 25), but--being a novel writer--I take that with a grain of salt. To each his (or her) own.